Below are videos from the series Transformers Transformed. I am particularly interested in developing abstracted remixes of a found bootleg copy of the movie Transformers 2: Revenge of the Fallen which director Michael Bay and star Shia LaBoef have both admitted was not a very good film. So perhaps this process offers some improvement? The first of these re-mixes “Transformed 01; Synthesized” involves an improvised alternate audio and visual score overlaid on the original film; fusing my interests in appropriation and electronic cymatics. Transformed 01: Synthesized (excerpt) from Lee Montgomery on Vimeo. Transformed 02: I am Sitting in a Theater is inspired by Alvin Lucier’s audio composition I am Sitting in a Room. A bootleg copy of Transformers 2: Revenge of the Fallen obtained on DVD was recorded through a video camera lens, off of a TV screen, and then re-recorded until the video became an abstraction. This is an exploration of our cultural obsession with resolution, as well as an interrogation of fair use policy and copyright law. Transformed 02: I am sitting in a theater (excerpt) from Lee Montgomery on Vimeo. Microcons “are swarms of little robots shaped like ball bearings, which unfold to reveal the robot hidden inside.” Considering them to be the primary building blocks of Transformers, and an extreme expression of transformational possibility I used the microcon scenes in Transformers 2 Revenge of the Fallen as source material for a digital layered mash-up of various analog processes applied to those scenes. Synthesized oscillations are meshed with the Throbbing Gristle song Persuasion very low in the mix, as a meditation on the saturated colors, and slick graphics of the original as appropriated in this new work. microcons and persuasion – revenge of the fallen from Lee Montgomery on Vimeo. Transformers Transformed evolved from an earlier project called Broadcast Version where popular films were recorded surreptitiously in theaters, and then altered for use in installations with television transmitters. Highlights include a tribute to Bruce Connor’s Crossroads created in the year of his death, and a meditation on surveillance and power through a remix of The Dark Knight. The Dark Night from Lee Montgomery on Vimeo. “Indiana’s Crossroads” for Bruce Conner from Lee Montgomery on Vimeo. 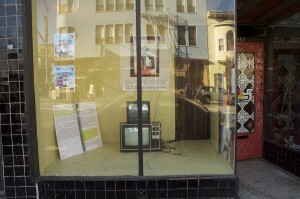 Early installation of Broadcast Version in the storefront of Artist’s Television Access in San Francisco.